During the Oman Mining Expo 2019 which is currently held at the Oman Convention and Exhibition Centre, Prof. Dr. Wilfried Bauer, Head of the Department of Applied Geosciences at GUtech and Prof Dr. Frank Mattern from Sultan Qaboos University gave a presentation entitled: ‘Current Situation and Future Direction of the Mineral Resources Education in Oman’. “With a growing mineral resources industry in Oman the demand for well-trained graduates and post-graduates in the field of geosciences will increase over the next years” said Prof. Dr. Wilfried Bauer. Therefore, applied geoscientists play a key role through the lifetime of a mining project that can take up to 20 years. Graduates in Applied Geosciences as well as specialist in Economic Geology, Geophysics, Geochemistry, and Geoengineering will have ample opportunities in the mining sector. Over the next 5 years, approximately 70-80 graduates will graduate from both universities in Oman each year. According to internal surveys conducted at GUtech , up to 30% of these graduates consider continuing with Master studies abroad or in Oman. However, this number strongly depends on the availability of financial support for Master degrees. In countries with a developed mining industry, e.g. in the United States, the ratio between academically trained workforce in the mineral industry is 1 PhD-holder versus 2.2 Masters versus 6.5 Bachelor graduates. Taking into consideration that Oman’s basement is still underexplored, it is recommended that a high number of post-graduates can adjust standard mining methods and develop exploration programmes in largely greenfield settings. “From a higher education perspective, a lack of mining engineers has been identified. This could be a bottleneck for future developments of the industry. During the last years, global employment rates of mining engineers were above 95% which means there are limited open job opportunities on the global job market. From the side of the job seekers, Omani graduates are currently focusing on jobs in the oil and gas industry. It will be a challenge to create more interest in jobs in the mineral industry and attract the brightest minds” said Prof. Wilfried Bauer. Currently only two higher education institutions in Oman, Sultan Qaboos University (SQU) and the German University of Technology in Oman (GUtech), provide advanced education for the mining industry. The education in the mineral resource sector covers principal courses in Mineralogy, Mineral Resources and Mineral Exploration at the bachelor level. Courses in Ore Mineralogy, Orebody Modelling, Mineral Production & Processing are part of a recently introduced or running Master curricula at GUtech. The objective of the two-day mining conference is to provide a venue for the industry as well as regulators to discuss various issues and challenges as well as to explore emerging opportunities and latest developments in Oman’s mining and minerals sector. HALBAN Fourteen female students from the German University of Technology (GUtech) conducted a 10-day fieldtrip to explore and study the geology of Oman. They were guided by Prof Dr. Gösta Hoffmann from Bonn University in Germany. Prof. Dr. Gösta is a geosciences expert in the field; he has run several international projects and has been granted the national research award for his work by The Research Council (TRC). The fieldtrip logistics were professionally organised by Golden Highlands, the leading geo-tourism company in Oman. As part of the field-trip, the group of students collected 237 kg of rubbish. Most of the items collected were clearly related to picnic activities, a problem that can be easily solved. „It is the second clean-up organised by Golden Highlands, after a beach clean-up last year with the professors from the German Geological Association (DGGV).” said Prof. Dr. Gosta. “It is our company’s responsibility to keep these places and our country clean. 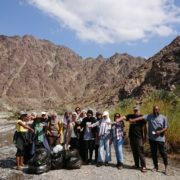 We therefore are an eco-friendly tour company in Oman. We try to minimise the amount of rubbish during the trips as much as possible. We do not distribute soft drinks in cans and water in plastic bottles. We provide solutions for refill and the customers use one mug through the trip. This mug they even take home as a souvenir. We also avoid plastic bags when shopping for groceries but use our own re-useable Golden Highland bags. Funny enough, people want to buy our bags as well instead of using plastic bags. We might even think of a business opportunity here,” said Mansoor al Shabibi, CEO of Golden Highlands. HALBAN Five Applied Geosciences students have won the third place in the prestigious AAPG Imperial Barrel Award semifinals that were held at GUtech in the past days. The students who are studying in the their final year in Applied Geosciences had to solve different geological tasks in groups such as analyzing a data set including geology, geophysics, production infrastructure, and other relevant materials for an oil exploration in the North Sea. 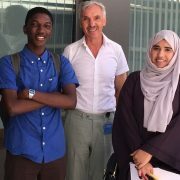 “Our GUtech team with Anwaar, Jahina, Omer, Sara, and Shihab won the third place which is a great success, they worked very hard and achieved results that normally can only be expected on the level of Master Students,” said Prof. Dr. Wilfried Bauer, Head of the Department of Applied Geosciences. The Department of Applied Geosciences has been hosting the annual event for the first time. 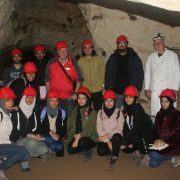 On the second day, all students from competing universities participated in an excursion through the Oman Mountains, led by Prof. Dr. Wilfried Bauer and Prof. Dr. Ivan Callegari, where they had a chance to study typical reservoir and source rocks of the Arabian Platform and their structural styles in the field. Each team had to deliver their results in a 25-minute presentation to a panel of industry experts and professors. Students had the chance to use state of the art technology on a real dataset, receive feedback from an industry panel of judges, network with potential employers in the audience, and win cash awards for their school. The judges selected the winning team on the basis of the technical quality, clarity and originality of presentation. The AAPG Imperial Barral Award is a hands-on opportunity for students to experience the creative process and the high-tech science that is the foundation of the Energy Industry today. 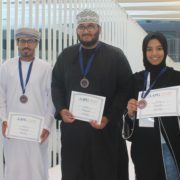 Students from Sultan Qaboos University (Oman) won the first place followed by the Lebanese University (Lebanon). 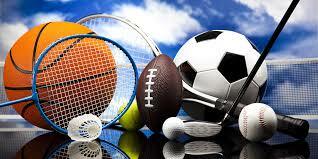 The winning team will participate in the final competition to be held in Texas (USA). Students from King Abdulaziz University, Hashemite University, the University of Jordan, Kuwait University, United Arab Emirates University and Yarmouk University participated in the competition. 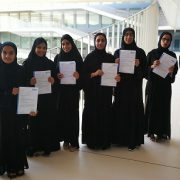 MUSCAT Six Geosciences students of the German University of Technology in Oman (GUtech) will participate in the Annual International Carbonate Course of the GeoCenter at the University of Erlangen (Germany). The students were awarded by the Rector Prof. Dr. Ing. Michael Modigell with GUtech study-scholarships for their travel to Germany in February/March 2019. The seminars will cover all classic and modern aspects of carbonate sedimentology and will include practical microscopy exercises using the worldwide largest carbonate thin- section and sediment sample collection of the GeoCenter. 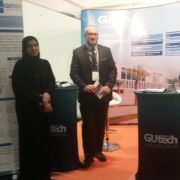 GUtech students will attend the course for the eighth time. 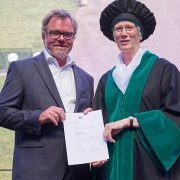 BONN Prof Dr. Gösta Hoffmann, who is teaching and researching at GUtech, was awarded with the Rectorate’s Teaching Award 2018 of the University Bonn recently. With this award the management of the University and the Faculty of Mathematics, Geosciences and Natural Sciences of the University Bonn recognizes Prof Gösta’s strength in teaching. “Prof. Gösta Hoffmann successfully combines theory and practise in his teaching. His classes are very popular and are focused on applying the theory during excursions and the student’s overall learning experience in the field. 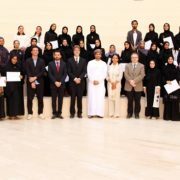 The award was given according to student’s evaluations and a student survey from the faculty,” said Prof. Dr. Thomas Bartolomäus, member of the Faculty of Natural Sciences during the award ceremony held at the university. “The field excursions are very popular among our students and they help to educate the next generation of Geoscientists. They highly qualify them to think out-of-the box and for their future work in the industry or in the academia,” said Prof. Gösta. Initially, Prof. Gösta Hoffmann studied Geosciences at the University of Greifswald (Germany) where he completed his PhD in 2004. 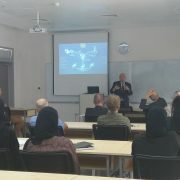 In 2008 he and his wife Dr. Anne Zacke moved to Muscat, where they were among the first faculty members in the Department of Applied Geosciences at GUtech. Since 2008 Prof Gösta is teaching at GUtech and conducting research on tsunami hazards in Oman. In October 2015 he was awarded with the National Research Award by the Research Council (TRC). 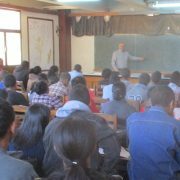 Prof. Gösta is teaching courses on geohazards along with excursions. In the past three years he has been conducting field excursions through Oman with students from different universities and research institutes in Germany. In 2016 Prof. Gösta completed his habilitation at RWTH Aachen University, GUtech’s German partner-university and he became the Head of the Working Group for General Geosciences / Environmental Geosciences at the Steinmann Institute of the University Bonn. The Annual Rectorate’s Teaching Award is given to those professors of various faculties who apply innovative teaching techniques and who receive high evaluations from their students. Caption: Prof. Dr. Gösta Hoffmann during the Award Ceremony along with Katrin Holm-Mueller, Vice-Rector for Academic Affairs of the University Bonn. HALBAN Two third of the Earth’s surface is made up of oceanic crust, which forms at mid-ocean ridges and is recycled into the mantle via subduction at convergent plate boundaries. During each phase of its 200 million year lifecycle the oceanic crust plays a key role in global geochemical cycles, including the carbon cycle. The inaccessibility of the seafloor makes it difficult to study. However, fragments of ancient oceanic lithosphere that have been tectonically emplaced on continental margins provide access to complete cross-sections of seafloor. These exposed sections of oceanic lithosphere are called ophiolites. The Samail Ophiolite in Oman is the largest, best-exposed section of oceanic lithosphere in the World. The Oman Drilling Project (ODP) is a comprehensive international drilling program that aims to sample the whole ophiolite sequence, from oceanic crust through to upper mantle, in a series of boreholes. Data collection includes analysis of rock core, geophysical logging, fluid sampling, hydrological measurements and microbiological sampling. The geoscientist, Dr. Philippe Pezard, University of Montpellier (France) is currently leading the geophysical logging of the boreholes. He shared his experience and information about the equipment used with students from the Department of Applied Geosciences at GUtech. Some students visited one of the project’s drilling sites last week. After completion of the international research project, a large number of scientists from a broad spectrum of disciplines will use the new datasets. The ODP will address long-standing unresolved questions and undertake frontier exploration of subsurface weathering processes that lead to natural uptake of CO2 from surface waters and the atmosphere, and the nature of the subsurface biosphere in areas. Drilling operations started on December 25, 2016. Intense logging is performed currently. The ODP is funded and supported by a consortium of international institutions, including GUtech.